Wanda Russell had just turned 50 when her bosses told her she would have to go back to college and get a bachelor of nursing degree to keep her job. Russell gulped. Back to college? At this stage of my career? Russell was an assistant nurse manager for operating rooms at Orlando Regional Medical Center in Florida. She had worked there for 16 years and already had a diploma degree in nursing from Grady Memorial Hospital in Atlanta, where she worked the previous 10 years. “I never thought I’d have to go back to college again,” she said. “I thought education was built on clinical experience and work, but they told me if I wanted to keep my job, I had to get a bachelor of nursing degree. Take out a student loan, $17,000 worth. That was the price it took to upgrade her degree and join a growing number of older people who need help from student loans to pay for education required by their jobs. The Government Accounting Office (GAO) released a report Sept. 10 that said student loan debt among adults 50-64 soared from $48.4 billion in 2005 to $157.5 billion in 2013. Student loan debt for those 65-and-older leapt from $2.8 billion in 2005 to $18.2 billion in 2013. The GAO report said that 80 percent of the student loan money taken out by older borrowers was for their own education, not their children or dependents. It was used mostly to pay for graduate degrees or continuing education classes ordered by employers. 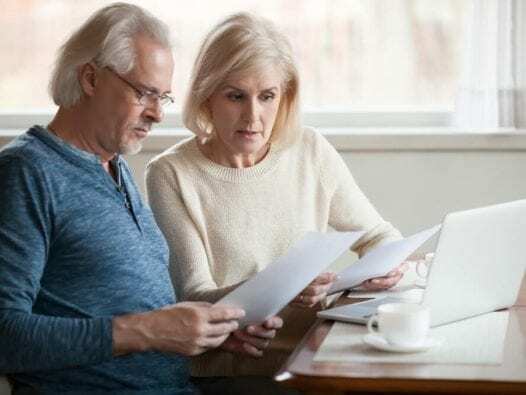 Paying back late-in-life student loans is a serious matter for those just entering retirement or fast approaching it. At best, it robs them of money that might normally go into a retirement account. At worst, if they default on the loans, the IRS will garnish their monthly social security to pay off the balance. The GAO report also said that seniors are more likely than young people to default on the student loans. About 27 percent of seniors default on loans as compared to 12 percent of people between the ages of 25 and 49. The GAO report says that more than the student loans held by people 74 and older are in default. The government can take all but $750 of the monthly social security checks, which puts some of those people below the poverty level. For people like Russell, that information is frightening. When she took out her student loan, Russell had just gone through a divorce that left her with a plate full of bills that included a mortgage payment. She had one daughter finishing college and another about to start. Going back to college – and paying off student loans to do so – was not in the budget. She used the $17,000 in loans to pay for classes at the University of Phoenix, a for-profit college. She tried to enroll at the state school in town, the University of Central Florida, which would have cost about one-third of that, but UCF would not accept her transfer credits. UCF told her she would have to take basic education courses, essentially starting from scratch. “I definitely wasn’t going to do that,” she said. So she enrolled at the University of Phoenix and spent 18 months taking night classes and doing homework on weekends to earn the Bachelor of Nursing degree her employer insisted she needed. When she finished, her job title didn’t change and neither did her salary. She basically took out a $17,000 loan just to keep her job. “That’s $17,000 that could have gone into a retirement account or helped me pay off the mortgage,” she said. “Instead, I’m paying off student loans and probably going to have to work past 65 to take care of all my bills.